Cross Creek West is an A-Circuit hunter/jumper training and sales stable located in San Marcos, California. Our trainers, Michelle Parker, Alejandro Alvarado, and Veronica Savery, lead a team of dedicated horsemen who work together at home and in the ring to turn out winning horses and riders at every level. We also specialize in the development of young horses, many that are in fact homebred at Cross Creek Farms in Tucson, Arizona. 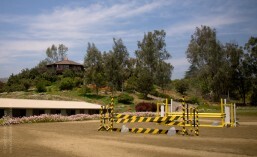 The facility, acquired in 2005, is situated on a secluded, inviting property conveniently located halfway between Southern California’s three premier horse show venues, Showpark of San Diego in Del Mar,the Oaks/Blenheim complex in San Juan Capistrano, and the new Temecula Valley National Horse Show Series in Temecula. The training stable enjoys a small and supportive client base who truly appreciate and participate in what the Cross Creek West team has to offer. Our talented trainers provide a plethora of knowledge, always seeking to improve the quality of life and performance of the horse and skill of the rider. There is limited availability for new customers and sale horses who will embrace and enjoy the special environment and philosophy of Cross Creek West. I just imported a Clintord 4 yr old from Germany. Love him! Congratulations on your 3rd this weekend. Tell us more! And thanks! Here’s the video of Saturday night’s round – bragging rights for your new addition.